Denver Gay Men's Chorus: Merry and Gay! Events > 2016 > December > Denver Gay Men's Chorus: Merry and Gay! The Denver Gay Men’s Chorus is celebrating 35 years and will entertain you this holiday season with Merry and GAY! 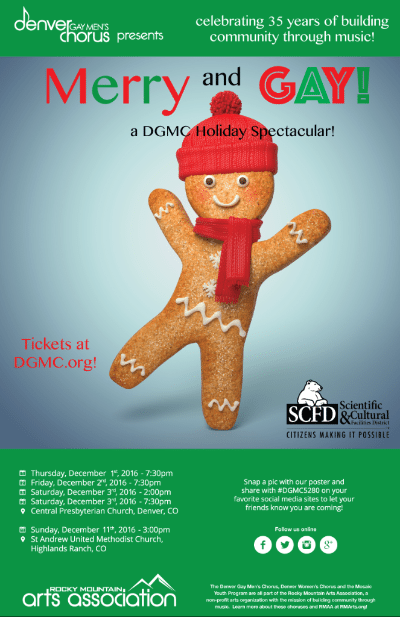 A DGMC Holiday Spectacular! With songs spanning from traditional to nonsensical antics at Santa’s workshop, you will love this show as much as the guys do singing it! Imagine Santa not letting you enjoy your favorite tunes while working in the workshop – why it’ll be a revolt! And what is up with Mrs. Claus?! You will be talking about this one for the entire season! James Knapp, Artistic Director of the Denver Gay Men’s Chorus, is excited to start the 35th season building community through holiday music, with a concert that has entertained our audiences since the beginning of the group in 1982. This is a time for celebration! And what could these singers want more than to celebrate with friends and neighbors? We hope you will join us in the newly renovated space at Central Presbyterian Church in downtown Denver, December 1-3 and in Highlands Ranch at St. Andrew United Method Church on December 11! Tickets are on sale now at DGMC.org or RMArts.org!